It’s not (thankfully) another house move that’s blocking my blogging this time. No, this time and perhaps worse – NO INTERNET! I hear you gasp, sympathetically (I hope). Yes, suddenly on 2 September, the internet as I know it in my building died and will remain dead until, well, it’s a long story and boring unless you have an interest in risers. It took the usual few weeks to find out what was going on, and then the fun started (I don’t mean sarcastic fun, I’ve enjoyed this). Our riser issue, serious though it is, will be fixed in the fullness of time. The enjoyment has been in finding ways to still have an online life. This blog post is therefore a triumph! Much more has gone into it than just the words. I’m thoroughly delighted to have had this experience, because it’s furthered one of my aims. Something I wasn’t intending to tackle just yet but it was on the to do list. And that’s to be able to function/work/write/doallmystuff anywhere in the world. It wasn’t on the agenda for now because, apart from I can’t afford travel the world is not remotely peaceful, and we’re seeing the spread of Ebola too. It’s a rubbish time to be crossing borders and an even worse one for visiting other cultures. Fear and distrust are everywhere and rightfully so. Neither war nor disease can be taken lightly, people seek the protection of their own. So I wasn’t planning to travel and I wasn’t too worried about being online-and-mobile. But I’m bothered about whether I’m online at all. So I’ve been having a great time (quack)(don’t worry about the duck will explain later) finding workarounds. This blog post is being written offline for a start – a habit I kept meaning to get into since it allows me to have a safe, easily accessible archive of my posts. I like WordPress lots, but last time I looked I couldn’t export my content as an easy, convenient .doc. Writing offline also gives me a chance to read and polish – it’s a fault of mine that I shoot posts out at top speed and I think that’s it done. Writing offline is habit I’m glad to develop. For the online part, I found out all sorts of things. I’ll be uploading this post in a while using a little EE device which gives me mobile broadband. (I call this my ‘brick’ – I don’t think that’s the correct name) I could be uploading this blog post from a beach, whilst sipping mango juice. I won’t be, but I could do it 🙂 !! Said beach would have to be in the UK and have 3G/4G coverage though. In other words my day-to-day needs are now fully met. It took a while to find this solution and a lot of the other stuff I tried and found out is situationally useful. For example if I fancy a nice cup of tea and a bun (or a meal) out while I work on something, I now have my favorite places I could go that have wireless internet. The gym has broadband attached to the treadmill and treadbicycle, library (what’s left of it) has free internet. All that kind of thing, useful to have it all at my fingertips. Later today I may go and ogle the ships in Leith Harbour. I can be online or offline, as I will. Noice! Having located wifi sources out there, my android tablet + EE box + usb keyboard + cover/stand = a small app-dependent internet-capable computer. I can’t work with things like Blender on the tablet, but I don’t need to be online to work with Blender. As with this blog, that’s offline work, can be done at home in fluffy slippers and anything that needs uploading I use the little EE brick/go out and find a wifi hotspot. Sorted. The tablet also works perfectly for such things as logging into a remote server via pUTTY and interacting with that server – there’s a helpful thing. In fact there are only a few things I can’t do using just that. The EE solution means I’m constrained by a data allowance (took a monthly plan but I’m sure PAYG is possible, and I’m sure there are other providers) and of course, the internet I have this way is slow. It works but it’s slow. Or is it. No it isn’t really that slow. Or rather it might be, but I’ve now discovered that my broadband, cable, supposedly the fastest available was in fact pretty inferior. I already thought that, noticed that speed-checks showed it to be very slow – now it’s proved beyond a doubt. Because with this setup I’m experiencing similar speed. Cost is less with the mobile broadband by the way. Global trotting would now just mean finding local internet access, the rest is sorted. The tablet + keyboard minicomputer, the phone as emergency backup, the laptop for heavy lifting. A wi-drive for portable storage – all those. Numerous Android apps have been discovered that fill in beautifully for the bloatier Windows “standard” software while I’m out and about. The ‘brick’ can connect up to 10 devices (including our laptops) – I quite like it. It wasn’t too hard to find my way back to the internet but I still want to become one of those wizards who can do it all with a Raspberry Pi and some rubber bands – I’ll keep that as an ambition. Doesn’t seem to be strictly necessary for now. I’m kind of sad about that. On the other hand everything I’m using now works and works together. And that’s because, to my surprise, more than a month has passed without my playing any online games. None. Nada. Zilch. Ok, I logged into Flutter on my Android, whilst on the bus (oh yes, another discovery – our Edinburgh buses now have wifi). Apart from that absolutely none. The fact that so much time has gone by without me really noticing the absence of big AAA, online games is telling. Clearly, I haven’t missed them. I could presumably play them now and will try it at some point. No rush. Very tempted to do a great big long ranty list of all the things I’m not missing about the AAA games, but nah. They have decisively lost the battle for my heart, time and money, lettem go. I can pick out a choice few of the things I’m not missing in some other post – and there are things I am missing, but I have to think about it to notice them. Oh yes, the duck. I keep hearing quacking in my head if some company advertises a “great job” – apparently this has now crept into any usage of the word “great” as an adjective. Let’s try it. “Great Scott!” Hmmm. No quacking. Oh well that’s a relief. I’m feeling my blog-skills got quite rusty while last year had it’s way with me, but things are loosening up now – same with the rest of life. Systems are generally go, but puffing dust out of all vents and even backfiring a time or two. This little game has kept me company. Yesterday, was Flutter’s birthday – it’s one year old! And not going anywhere near a sunset, I don’t think. The Flutter News adds, with glee, that the game is also celebrating 1 000 000 players. Yep, a million. 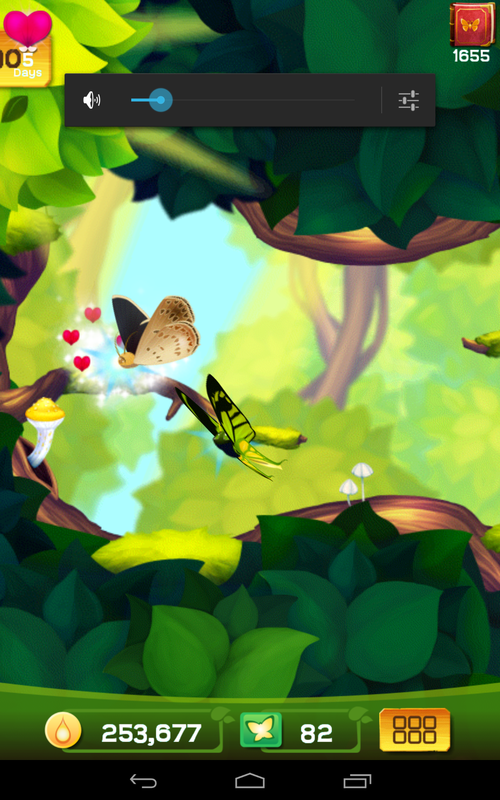 Well Happy Birthday Flutter – and I’m delighted to see Runaway’s game doing so well! Delighted but not surprised. It’s a cool game. And I normally dislike “cute”, so there you go (I enjoy the art in this game!). You buy Flutterbucks with Mobacoins which come in packaged amounts, closest being 1500Flutterbucks @ 4999Mobacoins (700Fb @2499, the package below it won’t do.) And so the attempt to squeeze up the amount you spend goes on through the currency trail. 5210 Mobacoins (the nearest package) = £39.99. It’s not a trivial amount and needless to say it didn’t happen. Better pull out that calculator before doing any impulse spend because it’s an “all or nothing” amount for that third decoration. Which means not only didn’t I spend £40 (yes, I know, bar one p), but I didn’t spend a lesser amount either, since no point. (The second decoration is attainable through just wait for Flutterbucks to accumulate – you do earn these very slowly – and buy eggs so all butterflies are upgraded). But before you fall off your chair or puff a “forget it”, as I usually do – there is more to the story. £40 aint going to happen, sure enough. However, one can acquire extra flowers in other ways than buying, so I’m still happy. It is possible to feed your frog treats to gain event flowers and these treats spawn from tasks, or just mysteriously appear at non-event times as well as during events. One can hoard up frog treats. I’m doing this for the next event, and already have a little hoard since I didn’t use them this time. (Will report back). As a quick indicator I blew 10 frog treats I’ve collected so far. 5 returned event flowers, and 3 were the bottlenecked flowers needed for the last two butterflies. Gosh this is getting technical. Frog-treat flowers aren’t 100% ones, like the ones you buy, you need to fuse them up to that 100% to guarantee the butterfly you want. So 3/10 isn’t hugely helpful, but might just save the day if one has enough frog treats and only needs an upgrade or so. Another way of completing, and more crucially, the event butterflies have special abilities. My screenshot shows a Tibetan Cupid which puffs out little hearts when you activate it’s ability. But not all the abilities are cosmetic. My Harmonia Mantle from the Christmas set allows me a free egg (long cooldown) – that represents a whole butterfly upgrade though (like an 100% flower). Another butterfly I have speeds incubation – very handy if an event is about to finish. Heh. Well you already know I have an interest in those legacy sets. (I still miss my Snowflake I sold by mistake 😦 ) So that’s my interest duly declared, but, and it’s quite a big thing, the older butterflies have a big impact on gameplay. Which does put new players at a disadvantage. New players haven’t collected these older butterflies with wonderful abilities that help you complete a set without spending £40. And the legacy sets are not available in any way, shape or form. New players just have to hope for good abilities in the current and future events and scrabble to complete the relevant butterflies, so they can join in this advantage. I really hope that changes. It’s a wibbly bit sticking out. Joining Facebook and adding friends who also play Flutter can gain you event flowers too, I think there’s a limit of 5 gifts friends can send. Yes. Just as UemeU got me to log into Steam after 10 years of not, so Flutter has persuaded me to finally and with trepidation make a Facebook account (that’s pretty good going for a game to do that right there). Not particularly impressed with Facebook so far, but have hardly explored, so no comment. Lastly there is the route of earning Mobacoins by trying out games, which as already noted, I’m finding more fun than a chore. Still haven’t uninstalled any. Must also be said you’d need to try out many many many games to earn that 4999 coins. (If you’re intending to try Flutter anyway, the weekend birthday giveaways still have some hours to run at time of posting this, by the way.) And now it’s time for my lunch, I’m hungry. Now to Flutter. Our most favourite Android game isn’t hard to pick. This is the one all of us play, and all people we introduce it to play, and I’m putting it out here, so I dare say that will mean even more people try it and get hooked. It’s about butterflies, which you collect. The butterflies don’t PvP. They do just flap about in their habitat like butterflies do. I can’t tell you what’s so compelling. I don’t know! True, collecting is compelling, but there are a lot of games where you collect things – fish, dragons, whatall. Perhaps it’s that thing where you take a simple notion and do it really well. It is a polished game and the balance is not too bad between buying/earning the Flutterbucks you need to complete sets. One is always tempted to buy, but there is the feeling that one could probably play a lot and earn enough to do the trick. More about that later. We are currently (squee) collecting a set. Last set, I bought Flutterbucks to complete (we had some Christmas money), this time I’m trying the ‘earn it’ route. For this balance to work nice, it does need to be possible to earn your way, albeit at great cost of time and effort. We shall see. I am currently logging in almost hourly to collect any honeydew/flowers. This for me is unusual behaviour. The game is on the good side of addictive. Which brings me to how it works: (I can’t remember what you start out with, but I don’t remember struggling). At the heart of everything is a book, which contains sets of butterflies and achievements. On screen is a round flower setting which allows you to adjust 3 factors – the set, the size, the rarity. You have a flower collection (flowers pop up in the environment, or are spat out by a frog when you feed it treats, can be earned through errands – many ways – and ofc you can buy them with real money.) Oops got to point out about about the money. It uses the cash to Mobacoin to Flutterbuck/honeydew system which old-fashioned dudes(and dudettes) believe obfuscates how much things cost. Unfortunately in this day and age most of the developed world posesses a calculator, internet banking and there are social networks to spread information far and wide. Flutterbucks are pricey when you figure out how many you need, but the game is good. Presumably whales are being believed in. I don’t mind topping up here and there to support the people making this but at those rates it’s not going to be a habit. Sadly. Because I’d like to complete every single set, ever ! – and I don’t have enough time to do it via time and effort. So you choose your flowers for set, size, rarity and place them in the wheel-like setting in the habitat, touch the centre and choose to attract an egg. Then a whirly thing happens and an egg arrives. You can use this as a sort of slot machine – just put one or two flowers and let the game choose your egg (I love doing this) or you can look in your Butterpedia (I don’t know what it’s called :)) and get very specific. Some flowers are rarer than others, as is right and proper. It’s a nice game inside the game. Ooh and the flowers are really pretty – in fact here’s a shout to the artists – I love! the graphics in this game. Even the eggs are pretty, and awww the littel caterpillars…. ( and the fine detail on the chrysalis). The music is nice and soothing, your egg takes time to hatch (how much depends on which butterfly) but sooner or later it gets a glowy pulsating ring and when you tap it, there is a stupendously appealing little caterpillar. This you move to a free nestybit in your habitat and feed it leaves (free, no purchase) when it’s hungry, through some stages. Then it hops up onto a twig and turns into – you know, I think this is one of they things where “you have to *be* there”. The end result is a butterfly that needs a few upgrades (flowers produce pollen to fuel this and each upgrade reveals pictures and info in the Fluttpedia). Hehehe. I know it sounds like fluff. Don’t care. It’s time to check for flowers! Hah gotta Red Pierrot flower. (need many more though). Ehm where was I? Oh yes, now and again there are events with special sets to collect which keeps everything fresh and we really do love the events (squee). Here though a word of warning. There is no way to get any of these sets after the event is over. The other day I sold my Snowflake by mistake – that’s from the Christmas set, and that’s it GONE FOREVER. So need to be on toes when selling butterflies. (Selling is back to the game, you get honeydew or a tiny amount of Flutterbucks.) Caused quite a little stab in my heart when that happened. (Also if you don’t quite finish a set, that means you never can.) With that words of warning out of the way though, all else is pretty good. It runs well, it looks nice, it sounds good, it’s pretty – and by whatever magic beans they put in their coffee, I feel compelled to play it. 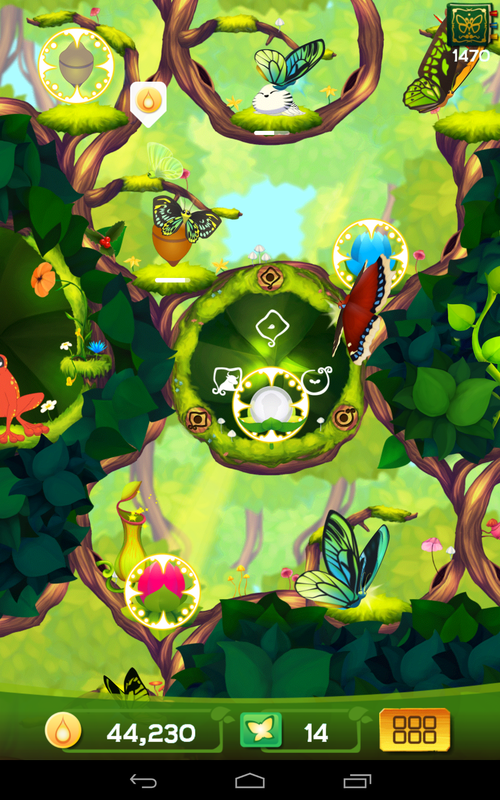 The game is made by Runaway games, and their blog is worth a visit: http://www.runawayplay.com/tag/flutter/ They seem very enthusiastic and motivated about – butterflies, wildlife, making games, all sorts of things. Can’t help wishing them well – love the WWF hut. And next I have nice things to say about Mobage which seems to be the umbrella under which Runaway released this game. And odd nice thing. You see, you can earn Mobacoins by installing other Mobagames. I tried it once. I thought “once”, but actually I never have never yet uninstalled any of the games I tried for Mobacoins and I’m quite happy to try more. There’s a thing!!! I mean who would have thought I’d really like a game about building CARS – but there it is on my tablet, installed and waiting for me to have more time to play it. Tried it, liked it, am definitely going to play it – along with all the others that I tried. Not a single one uninstalled. Which is amazing, because I’ve been through Google’s play store like a locust and though I enjoy most when I try them to some extent, few are keepers. My Nexus is stupid with screenshots, really absurd, got to hold it firm sideways on a table, push two buttons with split second accuracy & hope. I haven’t managed a nice screenshot yet but will keep trying (or maybe a Runaway/Mobage person reading this can send me one they’d like me to use). Update: finally got a screenshot and have added it to this post :). Big thumbs up for this game then. If I had one wish, it would be to be able to collect the Legacy/Event sets after they’re done – not only because of my lost Snowflake, but because when I looked on Flutter’s facebook page I started drooling. Some of those old sets are soooooo nice – please can we have a way of collecting them?